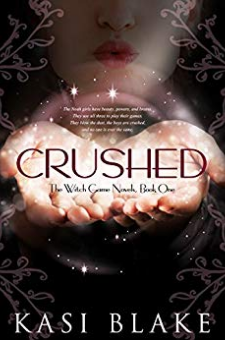 Falling in love can be a bewitch.“Pretty Little Liars meets The Craft.” ~ School Journal reviewThe Noah girls have beauty, powers, and brains.They use all three to play their games.They blow the dust,the boys are crushed,and no one is ever the same. A delightful mix of magic and romance with a twist of suspense enjoyed by all ages. Kristen and her sisters play a thrilling game each year to see who is the brightest witch in their household. They each pick a boy, blow magical dust in his face, and compel them to do their bidding. But being a senior is harder than Kristen imagined. Everyone seems to want something from her, and she’s being pulled in several different directions. So it isn’t that much of a shocker when she gets angry and blows pink dust into the wrong boy’s face. Zach Bevian, also know as tall, dark, and scary, is the exact opposite of the boy she should have chosen as her pawn. He’s too strong willed, too angry, and way too gorgeous. Worse yet, Zach is hiding something, a secret darker than hers. The question is, will she find love with him or will her reckless choice get her killed?